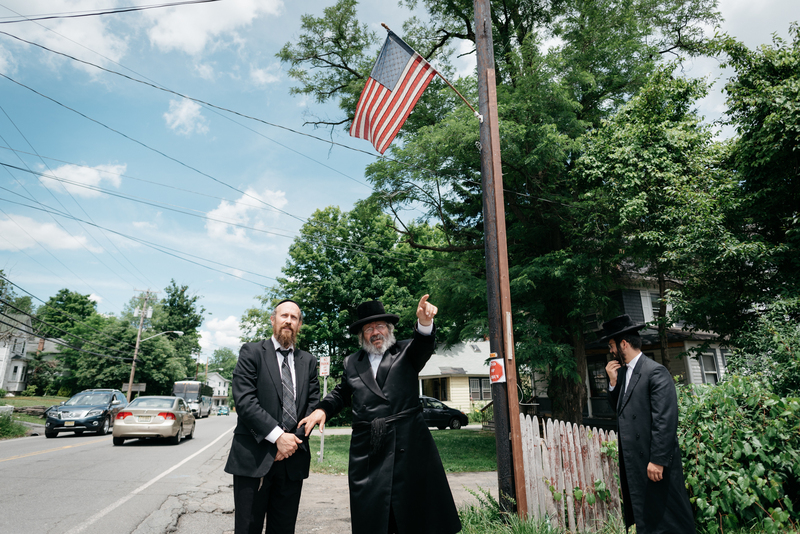 Fallsburg, NY - Summer visitors to the Catskills will find themselves enjoying a new addition to the Woodbourne landscape this season, with the completion of an eruv that encompasses a significant part of the Sullivan County village. 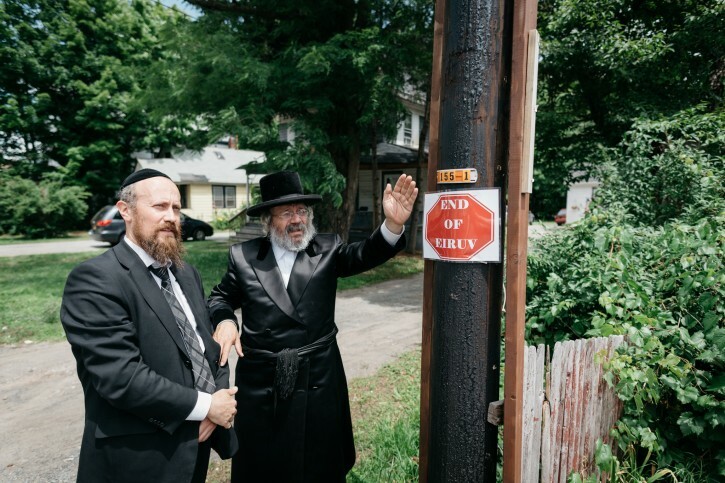 There was a big need for an eruv in the area according to Rabbi Mordechai Jungreis, the Nikolsburger Rebbe of Borough Park who serves as the rov of Congregation Bnai Israel, more commonly known as the Woodbourne Shul, which offers round the clock minyanim during the summer months. Work on the eruv, which was constructed by well known Eruv expert Rabbi Avrohom Goldberger, took place over several months and was done in conjunction with local authorities, explained Rabbi Jungreis. The project was sponsored by Yitzy Stark in memory of his brother Menachem Stark who was murdered in January 2014. 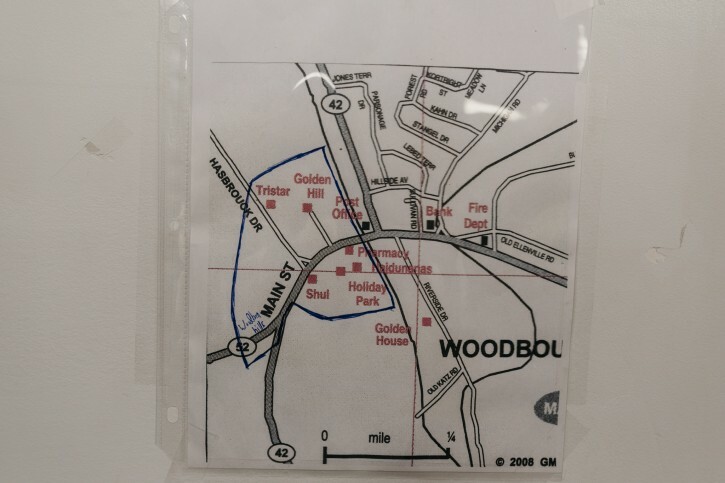 The eruv circles part of the village, extending south until the end of the Citgo gas station on Route 42, north until after the Golden Hill driveway on Hasbrouck Drive, west until the beginning of Woodbourne Hills on Route 52 and east until the beginning of the Route 42 bridge. The Eruv also extends partially into Maria’s Park but does not go all the way until the water and includes the village’s mikvah, the Woodbourne Shul, and the Tristar, Golden Hill and Holiday Park bungalow colonies. 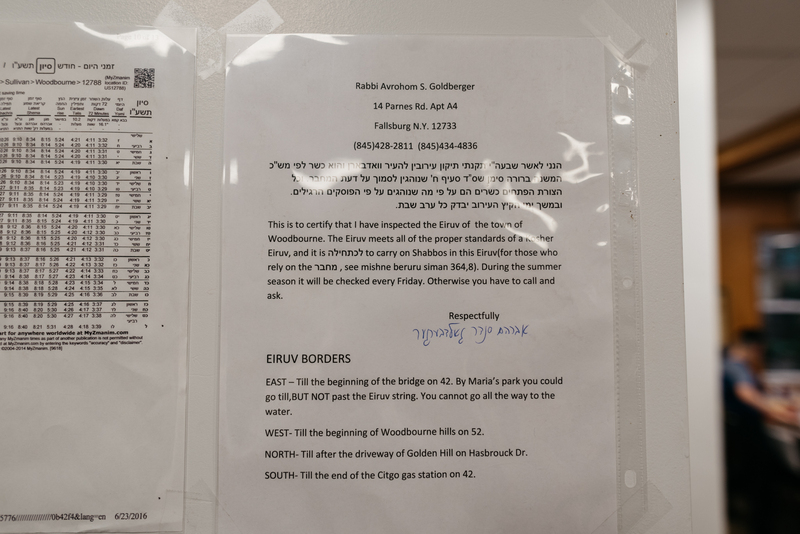 The eruv, which is under Rabbi Goldberger’s hechsher, will be checked every Friday during the summer season. Rabbi Jungreis acknowledged that while there are those who prefer not to use an eruv on Shabbos, it is a widely accepted concept that is brought down in halacha. I do not understand how construction such a thing is so difficult. But, as you know there is much I do not understand about Judaism. and yet in Brooklyn there is no eruv acceptable to the non-modern Orthodox. Simple, they have one set of rules and laws for the "country" and another for Brooklyn. I assure you one simple thing, if the MO had constructed this eruv, they would rule it non-kosher and boycott it. You have just shown your am hoaratzus. How you know not even the basics of halacha regarding hilchos eruvin, if you con compare Brooklyn to any town in the mountains. Classic you people call others am hoaratzus when they disagree with you. That's why your opinion counts for nothing with everyone outside of your daled amos. I believe there is a P'Sak R Moshe that an Eruv cannot be constructed in Brooklyn, as it is Reshus Harabim. The mountains do not have that issue. Ok, so keep all the thousands of mothers with small children in Brooklyn, housebound, and climbing the walls on Shabbos. perhaps someone should look at the comment rashi makes regarding an eruv. No eruv in Brooklyn was the psak of R Moishe ZTL ... good enough. “ perhaps someone should look at the comment rashi makes regarding an eruv. in Boro Park they have an eruv. Fine for you. However, many prominent rabbonim paskened otherwise. You can't force or threaten others that want to use an eruv in Brooklyn, some tried before and only found themselves in jail. You, too, are an ignorant fool if that is your response. It has nothing to do with disagreeing, it has to do with not knowing that there is major difference between Brooklyn and the small towns in the mountains. Not understanding the relationship of a reshus horabim to eruv is gross am hoaratzus. Except for the problem that Main Street is mefoolash and greater than 16 amos, and besides the fact that there is a sizable karfeef many times a bais sassayeem, and besides for the fact that the s'keras reshus is questionable, and not available to the public, perhaps it might be a good eruv. There is only one Shomer Shabbos family in Woodbourne all year and they are not within the "Woodbourne Eruv." All the mommas and papas that want to free themselves from the hardship of being confines to the walls of their homes is misleading. Those bungalows are all within bungalow colonies that have their own eruv. There is plenty of socializing within the colonies. Unfortunately, there is more Shabbos desecration now than in the last 17 years. Even with the signs that were finally installed, people still wheeled their carriages and babies and belongings out of the eruv to visit the local farm animals. This is a sad state of affairs for the Woodbourne community. I was just looking at the "Woodbourne Eruv Map" and I realized that the map is not to scale so it looks so simple to describe the borders, however, it could be a lot better and then the eruv rav would be better informed as to the extent of the eruv.